Find the best deals on the Nikon D3500 camera and D3400 camera for Black Friday and Cyber Monday 2019. 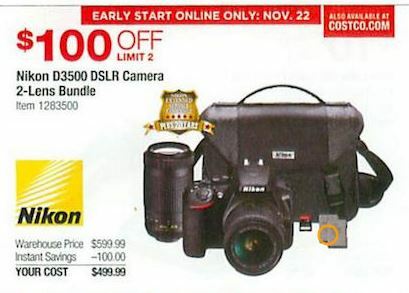 Funtober will search all of the online and print Black Friday ads to make sure that we have identified the biggest sales on this popular line of Nikon cameras. DSLR Travel Case and Nikon School Online Educational Class. Includes: AF-P DX NIKKOR 18-55mm f/3.5-5.6G VR lens. 24.2MP. 1080 full HD Video. Up to 5 FPS continuous shooting. 100-25,600 ISO. The Nikon D3400 is the popular entry level DSLR camera that is considered a top camera for amateur photographers. The Nikon D3500 is expected to be released during 2018 and will then be a prime target for discounts among online retailers and stores during Black Friday and Cyber Monday 2018. The D3500 will replace the D3400, which was first released in August 2016. If the D3500 is not released, we will be expecting discounts of 50% or more off the workhorse entry level Nikon D3400 DSLR camera. Last year, there were some tremendous Black Friday deals on Nikon D3400 camera bundles. Best Buy, Target and others offered a two lens bundle for $499.99, a savings of approximately 50% off the regular price of the product. 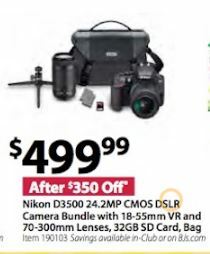 Although it is possible that they will be topped again during Black Friday as Nikon and electronics retailers looking to top their past discounts by adding the three camera lens bundle to offer increased flexibility with the camera system, it seems more likely that the big sales would have been used to clear out inventory to make way for the release of the D3500 this year. Discounts during the first year of a camera line’s release are not a given. So it is too early to say for sure how Nikon will be discounting it over the holidays. Given the competition in the entry level DSLR camera market, there will likely be some discount during Black Friday in order to drive buzz about the product and keep up with competition from Canon and others. The Thanksgiving weekend may be your best change to get a big deal on this camera if you are buying if for yourself or as a Christmas gift. The D3400 has 24.2 megapixel sensor resolution, 11 auto focus points, auto ISO up to 25600, pop-up flash with red eye reduction, and max video resolution of 1920 x 1080 with 60 frames per second and 1080p HD support. The stats of the D3500 haven’t been announced yet. The big department stores and retailers will start previewing their electronics sales early in November, so we will probably have a pretty good idea what at least some of the best Nikon deals will be early in the process. Nikon camera will likely see its own deals leaked or announced in mid-November, with the specialty camera shops delaying their own sales announcements for a few days longer. We will be posting all of the deals on the D3500 and D3400 here when they have become available. 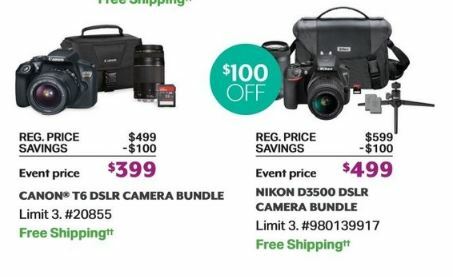 Camera deals happening on Cyber Monday typically aren’t announced until the Sunday after Thanksgiving at the earliest. So you will have to turn down a few camera deals before you know whether it is worth it to wait. The best camera deals are probably going to be part of the Thursday and Friday doorbusters, so we recommend that you start your camera shopping a bit earlier. But we will also be gathering the Cyber Monday sales here in case you decided to wait or there is a surprise. The Nikon D3500 camera has been released. It takes beautiful DSLR photos and videos with the ease of a point-and-shoot. 24.2MP, 5 frames per second continuous shooting, Full HD 1080p. Integrates seamlessly with compatible smartphones. Lightweight and balanced, even with a telephoto lens. Small and durable with two travel lenses for day trippers. Download the SnapBridge App for your photos to instantly appear on a compatible tablet or phone.